The MCP14700 is a high-speed synchronous MOSFET driver designed to optimally drive a high-side and low-side N-Channel MOSFET. The MCP14700 has two PWM inputs to allow independent control of the external N-Channel MOSFETs. Since there is no internal cross condition protection circuitry the external MOSFET dead time can be tightly controlled allowing for more efficient systems or unique motor control algorithms. The transition thresholds for the PWM inputs are typically 1.6V on a rising PWM input signal and typically 1.0V on a falling PWM input signal. 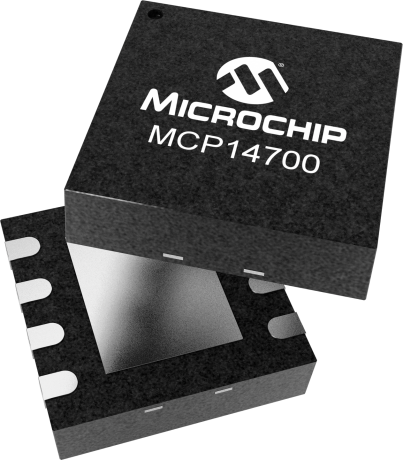 This make the MCP14700 ideal suited for controllers that utilize 3.0V TTL/CMOS logic. The PWM inputs are internally pulled low. The HIGHDR and LOWDR source current capability of the MCP14700 device is typically 2A peak. While the HIGHDR can sink 2A peak typically, the LOWDR can sink 3.5A typically. The low resistance pull-up and pulldown drive allow the MCP14700 to quickly transition a 3300pF load in typically 10ns. Bootstrapping for the high-side drive is internally implemented which allows for a reduced system cost and design complexity. The MCP14700 is available in a surface mount 8 Lead SOIC package with a body width of 150 mils and the 8 Lead 3mmX3mm DFN package.